The patty melt is always the first thing I eat at the Mule House Cafe. The last thing: fruit pie ala mode! Not everything you eat during a John Muir Trail hike comes from your bear canister. There are other opportunities before, during, and after the hike. These restaurants may not be considered fine dining or feature famous chefs, but the meal you eat in each will be special, especially compared to what comes out of that bear canister. Yosemite Valley. Remarkably, there aren’t any really good options here. The main dining room at the Ahwahnee was once superior, but my experiences there lately have been unexceptional. The pizza in the dining room above Degnan’s isn’t bad. Perhaps your best bet is the Mexican place at Curry Village. Tuolumne Meadow. There are two choices here, and both are good. 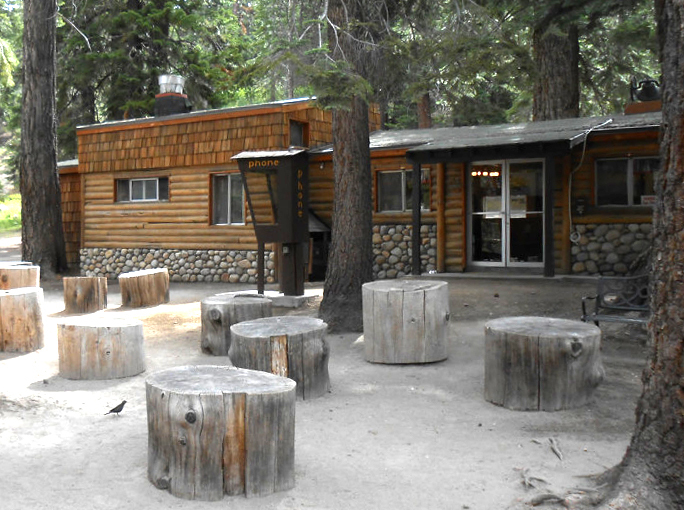 First is the Tuolumne Meadow Grill. Located on the south side of the Tioga Pass road, it shares the same building as the store. Breakfast has all the necessities, with portions that are the appropriate size for hungry hikers. For a JMTer who is shooting for ten-to-thirteen miles a day, and who started at Happy Isles, you will likely come across the TM Grill at breakfast time on day three. If you are taking a half-day off and spending the night at the Tuoulumne Lodge, be sure to make a reservation at their restaurant. The food is terrific, the menu changes frequently, and (unless there are eight of you) you will be seated with strangers. It is hard to beat good food AND good conversation with new friends. The Mule House Cafe. Since I take a zero day at Red’s Meadow, I get to eat at the Mule House Cafe more than once. My first meal, usually midday on day six, is their patty melt. It is superb. The tuna salad isn’t bad, either, and the fruit pies are amazing. Oh, and anyone who is walking more than ten miles a day for two or more weeks can drop a couple scoops of ice cream on that pie. The Dining Room at Muir Trail Ranch. This is another place where I spend two nights and a rest day. The meals are amazing. One breakfast I particularly remember was an egg/tomato/avocado combination that was well beyond tasty. Dinners are delightful and—weather permitting—are served outdoors. The morning you leave MTR for the last half of your hike, make sure you make yourself a sandwich for lunch. In fact, make two! Seasons in Lone Pine. Why on earth does Lone Pine have a restaurant as good as Seasons? Don’t get me wrong, I like the town of Lone Pine, but it isn’t a very big place, and one would expect the Denny’s to be about as good as it gets. Instead, based on the quality of their food, Seasons would succeed anywhere. The steaks are quite good, and they have a twist on an insalata caprese that is out of this world. The further along the trail you get, the food just keeps getting better. Another reason to hike southbound! Good ideas Ray……I’m on the train up to Merced as I write this. I realize that my suggestion is outside of Yosemite, but it is a great dining option on the way into or out of the Park – it is the Tioga Gas Mart & Whoa Nellie Deli. The food is absolutely delicious and creative wtih generous portions at reasonable prices. It’s at the intersection of Tioga Road (Hwy120) and Hwy 395. I would recommend this place to anyone! Thanks, Steve. I’ll try it out in September when I pass through on the way to the valley! These are all wonderful eateries Ray! The one thing I remember about MTR is that, at breakfast, you could pick off the menu or just have one of everything. Then, like you mention, the sandwich table! I walked out of there with a 5 lb sandwich! Glad to hear that I wasn’t the only one who was “enthusiastic” in my sandwich making! Thanks for the comment, Larry. I just ate at VVR. The burger for lunch and BBQ for dinner were great. I was amazed to get food that good, that far from civilization. Now I think food tastes better when you have been eating trail meals for a few days. So I am sure my taste buds were skewed. It would be interesting to try VVR for a regular meal, without 3 days of eating dehydrated food. Another thing about VVR is the people that work there and the hikers are fantastic. Thanks for the comment, Jim. I have never heard from anyone who did not enjoy the food at VVR, and the desserts are legendary! I left them off simply because I have been, thus far, denied the pleasures of their cuisine. Thanks again! I second Jim’s comment about VVR. I was there in 2012 arriving in the morning for a resupply pickup. I stayed for lunch which was so good that I decided to stay for dinner. It was excellent too. It was well worth the dark hike back to my campsite at Mono Creek. Wait, what about the Portal Store? Sure, if you’re not hiker-hungry, the food is so-so, but it’s the go-to place for immediately after your hike when you want a burger RIGHT NOW. Best of all, I guarantee you’ll still have room for another meal in Lone Pine. Every time I come down to the portal, Arla, I’m told that they are serving “fries only.” I guess I’m just hitting at the wrong time. Plus, I’m usually in a hurry to get to the motel. Thanks for the comment! Another good thing about these stops is the beer. Mammoth Brewing Company is a microbrewery whose beers I haven’t found anywhere but the Mammoth Lakes area. I really like the town of Mammoth Lakes, Victor. More here. Thanks for the comment! A lot of our trip concerned eating and planning for eating 🙂 We dropped our resupply at Muir Trail Ranch a couple weeks before the trip and enjoyed the three square meals. We ate at the Portal Store when we left our car, Toomey’s in Mammoth (two words: elk chops) on route to Yosemite for dinner, the Ahwahnee patio for lunch, Curry Village Pizza for dinner (not bad), then during the hike hit the Tuolumne Grill, the Mule House Cafe, (didn’t get a reservation at Muir Trail Ranch – boohoo) and finally back to the Portal Store for another round of burgers followed immediately by a pizza stop in Lone Pine. The next day we had a great breakfast in Lone Pine at the Alabama Hills cafe and picked up some of their fresh bread. One the drive back to Fresno we purchased beers and sodas at the Indian Wells Brewery on highway 395. I have no idea how we each came home about 8 lbs lighter! Elk chops? Sounds very interesting! I think I gained a pound just reading this comment. Quite the chef’s tour. I live in Independence and teach in Lone Pine. The couple who own and run Seasons also own one of the most popular goumet restaurants in the theater district of Manhattan. They fell in love with Lone Pine after coming out to hike in the Sierra some years ago and decided to transplant Seasons to Lone Pine. I eat there often. I travel a lot and if there is a better restaurant I haven’t found it yet! Thanks, Paul. What an interesting back story. I’m looking forward to eating there again around the holidays this winter.